Learn about scheduling processes in a single processor, in multi-processors, and in a Linux system. Learn about scheduling processes in an operating system by studying the course Operating Systems - Introduction to Scheduling. The course also reviews methods for scheduling with a single processor, multi-processors, and scheduling in a Linux operating system. The course begins by introducing you to process scheduling. You will learn about the two types or classifications for processes: first come first serve scheduling and its advantages and disadvantages, and other scheduling techniques such as Shortest job first and Round Robin scheduling and what they involve. You will learn about priority based scheduling and about setting priorities for your processes, and techniques for multi-processor scheduling and how they work. Next, you will be introduced to scheduling in a Linux operating system. You will learn how Linux classifies processes into real time and normal processes, about the different schedulers Linux has used in their systems and how they work. The course also covers Completely fair scheduling (CFS), the main scheduler used in Linux currently, and how the CFS selects processes for running. Perquisites: The learner will need to have completed the previous courses: Introduction to Operating Systems, Introduction to Memory Management, Introduction to Operating Systems Processes and Introduction to Operating Systems Interrupts. Having completed this course you will be able to: - Describe different methods for scheduling processes. - Explain priority based scheduling, how it works and its drawbacks. 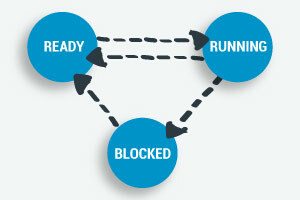 - Explain how scheduling works in a Multiprocessor environment. - Describe how Linux classifies processes. - Discuss schedulers used in Linux. - Describe how Completely fair scheduling works in Linux.